When Swiper tries to swipe the Christmas Star from Dora's Nochebuena Party, he lands on Santa's naughty list. To get back on Santa's nice list, Dora must help Swiper travel to the past, the present, and the future to discover the true spirit of Christmas. Will you help too?Special Features Wonder Pets - Save The Penguin Bonus Episode.. The Lost City: Dora has lost her teddy bear! Tico has lost his keys! Even Swiper has lost something! So Dora and Boots set out to find all the lost treasures at the Lost City. They'll need preschoolers' help to race through the Number Pyramid and fix the Mixed-up Jungle to get to the Lost City and find Dora's teddy bear...and all the other lost treasures too! Lost Squeaky: Squeaky, squeaky! Boots loves to squeeze his adorably squeezabl..
Own Dora The Explorer - Dora And Friends - Doggie Days DVD from Deff, DVD, Blu-Ray & 4K Video Specialists - Free UK Delivery..
Join Dora on a magical, double-length adventure inside a storybook to save the Crystal Kingdom from the greedy King! Plus other magical adventures! Dora Saves The Crystal Kingdom - The Greedy King has taken the crystals and drained the Crystal Kingdom of its colour! 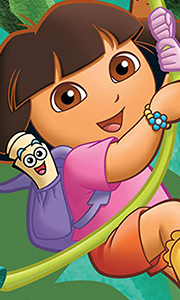 Jump into Dora's storybook with her on an epic quest to recover the crystals. She'll need your help facing knights, dragons, magicians, and more to bring colour back to the..
You're invited to some of Dora's biggest fiestas ever in this festive four-DVD box set! Kick things off with Dora's double-length birthday adventure! Laugh it up at the Super Silly Fiesta! Celebrate Dora's cousin's special 15th birthday party! Plus a Birthday Wizzle adventure, a pinata party, a surprise party for Boots, and more! It's a non-stop fiesta... in a box! Dora's Big Birthday Adventure: Dora's Big Birthday Adventure We All Scre..
Dora's Christmas Carol Adventure: iFeliz Navidad In this holiday movie classic with a Dora twist, Dora must help Swiper discover the true spirit of Christmas! When Swiper tries to swipe the Christmas Star from Dora's Nochebuena Party, he lands on Santa's naughty list. To get back on Santa's nice list, Dora must help Swiper travel to the past, the present, and the future to discover the true spirit of Christmas. Will you help too? Dora's..
Get ready for an egg-citing Easter adventure as you help Dora and Boots save the Hip-Hop Bunny's basket of eggs! Plus, a troll wedding and a trip to Troll Land! Dora's Easter Adventure - Dora and Boots are waiting for a visit from the Hip-Hop Bunny, who's bringing all the Easter Eggs for the big Egg Hunt! But when Swiper swipes the Hip-Hop Bunny's basket, Dora and Boots need your help on an adventure to make sure it's a hop-hop-hoppy E..
Big Sister Dora Big Sister Dora - Dora needs to hurry home! Her Mami is having a baby! Is it a boy or a girl? Help Big Sister Dora and Boots find the quickest way home so that they can discover the surprise! Dora Saves The Game - Dora has to run to the soccer stadium! Her cousin Daisy needs one more player for her team, and only Dora can save the day. Help Dora run, jump, kick, and save the big game! Job Day - What do you want to be w..
...from riding his first bike to finding his missing boots and more! You can help him too on these 4 fantastic friendship adventures! EPISODES: Boots' First Bike - Boots is ready for his first big-kid bike! Help Dora take him on an adventure to the Bike Shop and help other friends do new things for the first time too! iVacaciones! - Its Vacation Time! Help Dora and Boots pack up to meet Diego and Baby Jaguar for a night at the Rainfor..
Ride to the rescue - and share a love of reading books along the way - with Lady Knight Dora in these two knightly adventures, featuring the legendary Don Quixote! Dora's Royal Rescue Double Length Episode: In this double-length adventure, Lady Knight Dora and Squire Boots embark on a noble quest to help Rocinante the Horse save Don Quixonte, who has been locked in Story Castle by the mean Malambruno! Help Dora dance past a spider, ove..
Help Dora go for the gold when she heads to Brazil with her team for the Big Cup Soccer Tournament! Plus, travel back in time for an ancient Mayan ball game, help Dora save her cousin Daisy’s soccer game at the stadium, and watch the animal athletics at Boots and Baby Jaguar’s circus!Dora's Super Soccer Showdown: Dora and the Golden Explorers need your help in the Big Cup Soccer Tournament in Brazil! Will you help them beat the Monste..
Get ready for big surprises... ...with Dora and Perrito in 3 barking-good adventures! Help Dora bring Perrito to Surprise Hill to see his surprise before Swiper gets there and swipes it - and along the way, meet all of Dora's friends' pets too! Then, take Perrito to the Twins' Day Party to meet his twin and rescue Benny from an island! Vamonos!Perrito's Big Surprise: Dora has a big surprise for Perrito on Surprise Hill, but Swiper's t.. The Shy Rainbow - Help Dora and Boots on a colourful adventure to get a shy little rainbow to his first big job in the sky over Rainy Mountain! Journey To The Purple Planet - Blast into outer space with Dora and Boots to bring five lost space creatures back to their home on the Purple Planet! A Crown For King Juan El Bobo - Silly King Juan el Bobo needs help from Dora, Boots, and you to find his crown before his Mami's birthday party s..
Super babies’ Dream Adventure - Before naptime, Dora tells the twins a super story about how the Super Babies (and you) helped the Dream Fairy bring happy naptime dreams to all! Dora helps the birthday Wizzle - Join Dora and Boots on a birthday adventure to help bring a wishing wand back to the Birthday Wizzle and birthday wishes back to everyone in Wizzle World! Pirate treasure hunt - Yo-ho-ho! Climb aboard Pirate Pig’s ship and help ..
Super Silly Fiesta! When Big Red Chicken loses his cake, Dora and Boots need your help on a giggle-filled journey to save his Super Silly Fiesta. Boot's Special Day. Go ahead, make Boots's day! Because it's Boot's Special Day-un dia especial! Help him lead the Big Drum Parade, see Diego at The Animal Rescue Center, and even visit his Daddy at work. Stuck Truck. Calling all trucks! When Ice Cream Truck gets stuck in the muck! Help Boo..
Join Dora and Boots on these family adventures as you catch stars, stop swiper, and more! Big Sister Dora: Dora needs to hurry home! Mami is having a baby! Is it a boy or a girl? Help Big Sister Dora and Boots find the quickest way home so they can discover the surprise! Dora Saves The Game: Dora has to run to the soccer stadium! Her cousin Daisy needs one more player for her team, and only Dora can save the day. Help Dora run, jump..
Star Catcher: Abuela gives Dora a Star Pocket, making her a Star Catcher! When Swiper swipes the Star Pocket, Dora needs you and the Explorer Stars to help her recover it and rescue her new star-friend, Woo Hoo! Star Mountain: Oh, no! Swiper swiped Dora's necklace and threw it to the top of Star Mountain! To get it back, Dora needs your help, and the help of some special Explorer Stars too! Louder: Dora and Boots need to help Red Rooste..
Dora's Dance To The Rescue. When a mean Dancing Elf tricks Swiper and traps him in a bottle, Dora needs to dance to the rescue! Help Dora and Boots move and groove their way through a pyramid, across the ocean, and to King Juan El Bobo's Castle so they can win one Big Wish and save Swiper! Plus... Rescue, Rescue, Rescue! Baby Jaguar is stuck in a tree! Isa is stuck in a sand hole! And Benny is stuck on top of Gooey Geyser! Will you hel.. Together, all for one! Join Dora, Naiya, Emma, Kate, Alana, and Pablo for 4 magical adventures! Help Dora and her friends travel to an ancient world to return a lost ring, discover a talking ship in a secret pirate cave, embark on a royal adventure to return a dress to a princess, and bring dance back to a town where it’s been outlawed! Que magico! Episodes: We Save A Pirate Ship!, The Royal Ball, The Magic Ring, Dance Party..
Dora Saves The Three Little Piggies: When Swiper swipes stuff right out of some classic fairytales - including the Three Little Pigs' bricks - Dora needs your help to return to Fairytale Land and set things right! The Mayan Adventure: Dora and Boots travel back in time to an ancient Mayan civilization to help their friends Hoon and Balan win the Ball Game Championship against a cheating player named Pech. Bouncy Boots: Boots can't wait ..
To save the Snow Princess, all Dora needs is a smile... and help from an explorer like you! Join her and her friends on her double-length adventure through Snowy Forest! Dora saves the snow princess. When a mean Witch traps the Snow Princess in a tower, Dora and friends need your help to jump right into a storybook and join the Snow Fairy on a quest to rescue the Snow Princess and save the melting Snowy Forest! Doctor dora: Achoo, a..
Dora's Ballet Adventure: Dora can't wait to perform in her big dance show, but before it can start, she needs your help to move and groove back to her Dance School to find her ballet slippers! Dora, La Musico: The townspeople are having a musical parade, but when Senor Shush locks all of their instruments in a Music Box, Dora and Boots take their own parade to town! The Super Silly Fiesta: When Big Red Chicken loses his cake, Dora and B.. In the final episode of the Magic Storybook trilogy, Dora and Boots need to get home from Wizzle World for Dora's fiesta de cumpleanos! Dora's Big Birthday Adventure – Dora and Boots need your help on an epic quest to get past a mean witch and find the Wishing Wizzle so they can wish themselves back home in time for Dora's big birthday party! We All Scream For Ice Cream – The ice cream truck has sped off, but Dora and Boots really want..
Dora's Christmas Disc: A Present For Santa, Feliz Navidad! Merry Christmas! Dora and Boots want to bring Santa some holiday cheer, but to get all the way to the North Pole, they'll need your holiday help! Rapido Tico: Boot's toy firetruck is atop Snowy Mountain, and he and Dora need to get it before Swiper does! Tico to the rescue! Dora's fastest friend will help her and preschoolers race over land, lake, sky, and snow to get to the .. Present For Santa ¡Feliz Navidad! Merry Christmas! Dora and Boots want to bring Santa some holiday cheer but to get all the way to the North Pole they’ll need your holiday help! ¡Rapido Tico! Boots’s toy firetruck is atop Snowy Mountain and he and Dora need to get to it before Swiper does! Tico to the rescue! Dora’s fastest friend will help her and preschoolers race over land lake sky and snow to get to the fire truck! Quack! Quack! ..
Dora's Easter Adventure: Get ready for an egg-citing Easter Adventure as you help Dora and Boots save the Hip-Hop Bunnys basket of eggs! Plus, a troll wedding and a trip to Troll Land!Egg Hunt: From finding eggs to searching for the perfect way to say "Happy Mother's Day", springtime holidays take the cake with Dora the Explorer! Join in her fiestas with these special springtime adventures!.. Egg Hunt: It's an egg-cellent day for an Egg Hunt adventure! Dora and Boots need preschoolers' help to find all the eggs including the Big Yellow Egg with a big prize inside. El Dia De La Madres: It's Mother's Day! Help Dora gather the ingredients for Mami's cake, and help Boots, Benny Tico and Isa prepare their Mother's Day gifts too. Just watch out for Swiper! Dora, La Musica: The townspeople are having a musical parade, but when S..
Help Dora start the Fantastic Gymnastics Show, win a ribbon with Pinto in the Big Horse Show, and find Swiper's favourite things in these 3 big adventures! Dora's Fantastic Gymnastics Adventure: Dora gets to start the Big Gymnastics Show! But when Swiper swipes her special rainbow ribbon, Dora and Boots need your help on a gymnastics-filled adventure to get it back!Special Features Plus 3 Bonus Episodes:, 'A Ribbon For Pinto! ', 'Swip.. Dive into adventure...as Dora returns to Mermaid Kingdom for an awesome undersea journey! Plus, rescue Benny from Coconut Island and join Dora on an adventure through a moonlit storybook world! Episode - Dora's Rescue In Mermaid Kingdom – Mermaid Dora and Sea Monkey Boots need your help to swim past an Octopus's Garden, ride a whale, and more to get their new mermaid friend Maribel back to her Mami in Mermaid Cove!Special Features Pl.. Explore the Enchanted Forest ...with Dora, Boots, and King Unicornio in this trilogy of magical adventures, concluding in an enchanted double-length episode!Tale Of The Unicorn King: Unicornio has been chosen King of Enchanted Forest, but he needs help from Dora, Boots, and You to see that he's kind, smart, brave, and strong enough for the job!The Secret Of Atlantis: Dora, Boots, and King Unicornio leave the forest to join Diego ..
Mixed-up Seasons - Dora and Boots love the beach in the summer, but someone doesn't - a snowman! Help Dora and Boots fix all four mixed-up seasons! Star catcher - Abuela gives Dora a star pocket, making her a star catcher! But when Swiper swipes the star pocket, Dora needs you and the Explorer Stars to help her save her star-friend, Woo-Hoo! Star Mountain - Oh, no! Swiper swiped Dora's necklace and threw it to the top of Star Mountain!.. Once upon a time, Dora and Boots went exploring in Fairytale Land. But when Boots falls under a mean witch's spell, Dora must set out on her toughest adventure yet-she must become a true princess to awaken Sleeping Boots! Will you help her become la Princess Dora? What Happens Next? : The wolf huffed and puffed...what happens next? Dora uses her imagination to add an exciting adventure to the end of her story! Join her journey through .. Happy Halloween! Celebrate with Dora, Boots, and Little Monster in two night-time Halloween adventures, and then join Dora for a backpack and musical parade too!Halloween Parade: On this night-time adventure, all of Dora's friends have their costumes, except Little Monster! Help him find a costume so he can march in the Halloween Parade too!The Packpack Parade: Everyone's packing their backpacks for the Backpack Parade! Backpack ne..
Yo ho ho! Dora and all her friends are putting on a musical Pirate Play, but when the Pirate Piggies accidentally takes Dora's treasure chest, she and her friends need to set sail on an epic sing-along journey to get it back - all while catching stars, avoiding swiper, and more! Dora Saves The Prince: Once upon a time, a mean witch banished Prince Ramon to the High Tower. When Dora and Boots read this, they leap into their storybook to..
Dora's Got A Puppy: Dora has a present for her new puppy, Perrito, but Swiper has all-new sneaky swiping tricks! Help her make it home with the present! Doctor Dora: Achoo, achoo! What's that sound? Benny the Bull is sneezing! It's Doctor Dora to the rescue as she sets off to Benny's Barn for a house call. Save The Puppies: Dora and Boots are counting on your help when they jump into a video game to save 100 puppies from a mean dogcat..
Rhymes And Riddle: Dora Had A Little Lamb: Mary had a little lamb, its fleece was white as snow; but when the Little Lamb gets lost, Dora and Boots know where to go! Preschoolers join them as they jump into a big book of Nursery Rhymes to bring Little Lamb home to Mary. Along the way, they'll help nursery rhyme pals pick pickled peppers or climb a waterspout, all while helping Dora catch stars! Call Me Mr. Riddles: Boots loves riddles..
A wind blows Boots away? Swiper saves the day? Get ready for some really special rescue missions with Dora and her cousin Diego!EPISODES: Dora And Diego To The Rescue - When a mighty wind carries away Boots on his kite, Dora and her cousin Diego need help from you and some animal friends on a high-speed, around-the-world adventure! Swiper The Explorer - To help a lost baby fox get back to his fox hole, Dora and Boots get help from an..
Join Dora and Boots on a sing-along adventure to get to the Pirate Piggies' ship! Ready for a musical journey? Well, come on! iVamonos! Excellent Songs from Dora such as: Boot's Special Day, The Backpack Song, Boingy Boingy Bing, Hit the Ball, The Happy Song, Super Babies, La Musica, Tenemos Amigos, Caliente, What Happens Next?, Fairytale Land, Hola, Hola, Buzz Buzz, The Bubble Song, The Squeaky Song, The Alphabet Song, Itsy Bitsy Spide..
Rhymes And Riddle: Dora Had A Little Lamb: Mary had a little lamb, its fleece was white as snow; but when the Little Lamb gets lost, Dora and Boots know where to go! Preschoolers join them as they jump into a big book of Nursery Rhymes to bring Little Lamb home to Mary. Along the way, they'll help nursery rhyme pals pick pickled peppers or climb a waterspout, all while helping Dora catch stars! Call Me Mr. Riddles: Boots loves riddle..
Super Babies: Super Babies: Dora tells her baby brother and sister a super story in which they're Super Babies! But even Super Babies need your help to get their baby food back. Catch The Babies: Oh, no! The babies have climbed into their baby carriage, and are rolling downhill! Help Mami, Papi, Dora and friends try to catch them! Baby Dino: When Dora and Boots find a lost baby dinosaur, they need the help of Diego's, some Explorer St..